There is nothing better than a piping hot bowl of soup to warm you up on a cold winter's day. If you are an athlete, that delicious bowl of goodness can be functional too. 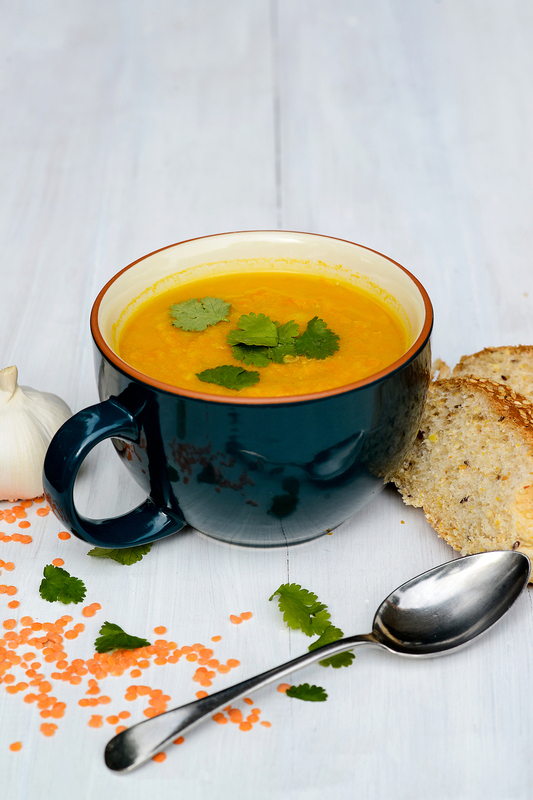 Soup is one of the most hydrating fluids you will find and with the right mix of ingredients can tick all the boxes for recovery. Different types of soup can provide different benefits, and you can create your own soup to match your specific recovery needs. Did I mention soup can be a great option for weight loss too? The best way for our body to cool down during exercise is to sweat. Some people sweat more than others. Hydration is important for performance, however in winter we may not sweat quite as much and tend to neglect our fluid intake in comparison to the thirsty summer months. What do athletes usually drink to hydrate? Water, sports drinks and electrolyte replacement supplements immediately come to mind. These provide fluid as a priority, but also contain various amounts of carbohydrate for fuel and electrolytes for hydration. Sports drinks are often designed to provide both carbohydrates and electrolytes, while electrolyte replacement supplements focus more on electrolytes and less on carbohydrate. Both sports drinks and electrolyte supplements can be beneficial under certain exercise conditions, and can be particularly useful for during training and competition of long duration. But if you are looking for a pre- or post-exercise option for hydration you really can't go past soup. What is so magical about soup?? The main electrolyte in sports drinks and electrolyte replacement powders/tablets/drinks is sodium. If you look at the nutrition composition of soup it is clear that most soups contains significantly greater amounts of sodium compared to electrolyte replacement supplements. Why? Because soup is often high in salt, which is high in sodium. So unless you are following a low-salt diet for health reasons* and making home-made low-salt soups, you will find that most soups are high in sodium (although it does vary between styles of soup and the exact amount of salt added). Soup might not always be the first choice of fluid to drink DURING exercise, however it can be well suited to many types of training and competition. For example, ultra-endurance pursuits where exercise intensity is lower and there may be more opportunity to consume a wider variety of foods/fluids. Intake during exercise doesn't always have to be sweet! If soup is not your thing during exercise, it could be worth trying pre- or post-training or an event. Nutrient information per 100ml of fluid. Ranges provided take into account different brands and preparation techniques, and are estimates only. Exact composition of specific soups will vary accordingly. For more detailed nutrition composition data for soups in Australia, have a look at the product comparison chart by Dietitian Connection. * Some people need to reduce salt intake for health reasons, however I find that athletes often restrict sodium believing it is good for them, when in fact many athletes require additional sodium to address their losses via sweat. If you have a health condition that requires a reduced salt intake then it is important to follow guidelines provided by your health practitioner, but if you are unsure of your individual salt and sodium requirements speak to an Accredited Practicing Dietitian, in conjunction with your GP. Some soups are extremely high in sodium. I am not advocating for excessively high salt intakes. The salt content is high in many processed foods, as you have probably noted from the table above. Many people get more than enough sodium through food and drinks. However if you are eating mostly fresh and minimally processed foods, and you lose sodium via sweating during exercise, you may need to consider strategies for adequate sodium intake, particularly around exercise. It can be difficult to work out exactly how much sodium you need to consume to account for sodium losses, if you unsure about your individual needs have a chat with a Sports Dietitian to help you plan your intake safely and effectively. Soup provides fluid, fuel and electrolytes as a perfect pre-exercise package. Soup can be easy to digest and terrific for stomachs that feel the effects of nerves. Some people find a solid meal prior to exercise a little hard to manage, so a liquid option can solve the problem. Smoothies are great too, but if hydration is a priority and heavy sweating is on horizon, then the additional sodium can be useful. Milk contains sodium too, around the same amount as many sports drinks, but soup tops smoothies for electrolytes. The great thing about soup is that you can tailor it to exercise needs. Add in some barley or noodles for carbohydrate if fuel requirements are high and try using low GI ingredients such as sweet potato and quinoa if you are looking for sustaining carbohydrates. Or use rice if you want something quickly digested. You can also adjust the salt to your taste and hydration needs. If your training or competition is demanding or lengthy, add extra protein or carbohydrate for a more sustaining chunky style soup. Or keep it light for before easier sessions where fuel needs are not as high. Time to add the protein and carbohydrate for a soup that will help your body re-hydrate, refuel and repair. Fluid and salt will help you rehydrate. Ensure recovery soups also contain a decent amount of high quality protein such as meat, chicken or fish to start the muscle recovery process. You may need some extra carbohydrate too, as most soups contain more water and vegetables than carbohydrate. Choose a soup with a potato/sweet potato, noodle or quinoa base or a minestrone style with pasta and beans. You may need some bread or crackers too, depending on your carbohydrate requirements. Talk about multi-talented, soup can not only fuel, hydrate and repair, but can help you lose weight too. The best type of soups for weight loss incorporate broth style rather than cream or carbohydrate base. Pack as many vegetables in as you can for filling fibre, plus some lean protein, for a low-kilojoule, satisfying and nutritious meal option. You don't need to have soup 3 meals per day, but maybe take for lunch or a quick and easy dinner. Make soup in big batches and freeze in individual portions for fuss-free preparation. Want more good news about soup - it's a great way to use up your leftover vegies and add cheap and cheerful legumes for maximum nutrition at minimal cost. Pull out your biggest pot and make some soup today! The recipe for my Pumpkin and Lentil Soup as pictured, is from my book Eat Right for Your Life. Older PostKids' party food - go healthy or sugar-laden free-for-all?